Copyright 2008, 2009, 2011, 2013 by James E. Lancaster, Ph.D. 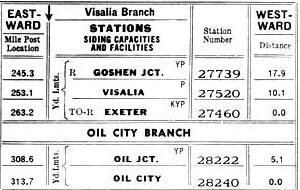 The Eastside Lines consisted of Southern Pacific and Santa Fe branch lines between Bakersfield and Fresno to the east side of Highway 99, plus the Visalia Electric (VE) Railroad. This area is dotted with active and former packing houses for citrus, stone fruit and grapes, wineries, cold storage facilities, and associated businesses, as well as miles and miles of orange groves and vineyards. A visit to this area is like stepping into the past. I made my first visit in July 2006 and after realizing how much there was to see I made return visits in August 2006, November 2006, August 2007, March 2008 and September 2008. And there are still places I've yet to see and photograph. My visits occurred after most of the railroad activity, particularly shipping perishables by rail, had ceased. Fortunately others had been photographing packing houses and other railroad activity since the 1970s and I am indebted to them for their contributions to this effort. This list includes Bob Chaparro, Robert Gaddie, Bill Messecar, Cliff Prather, John Signor and Randy Sunada. Their contributions are noted in the photo credits and elsewhere. 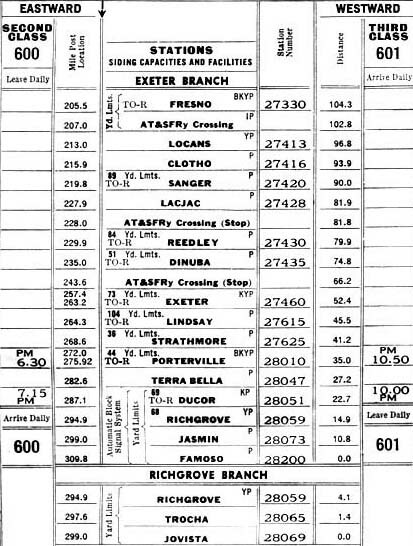 The Southern Pacific Eastside Lines consisted primarily of the Exeter, Richgrove and Visalia Branches listed in the employee timetables shown in Figures 1 and 2 (Reference: Southern Pacific Company San Joaquin and Los Angeles Divisions Timetable Number 2). Figure 1. Exeter and Richgrove Branches, Bakersfield Subdivision. 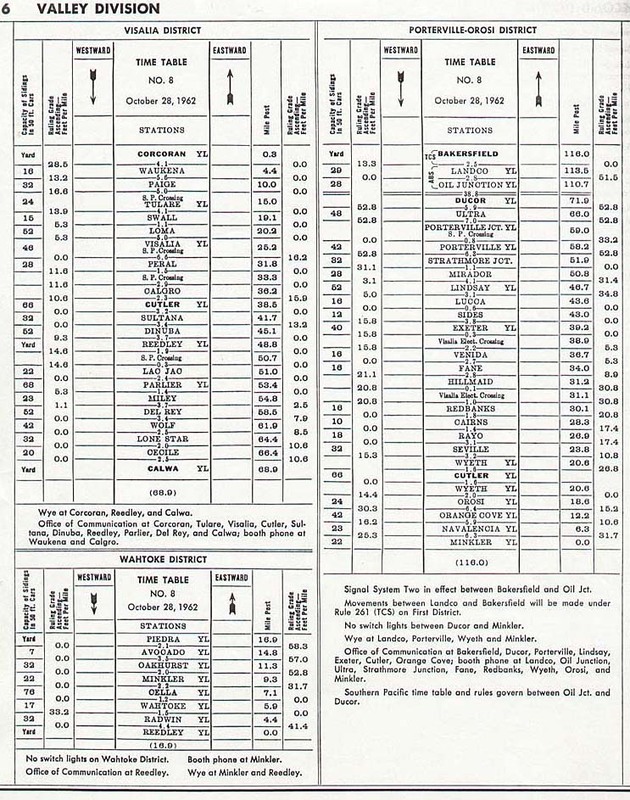 The Santa Fe Eastside Lines were comprised of the Visalia, Porterville-Orosi and Wahtoke Districts listed in the employee timetables shown in Figure 3. The Porterville-Orosi District was also known as the Minkler Southern Railroad. Figure 3. Santa Fe Employee Timetable for the Visalia, Porterville-Orosi and Wahtoke Districts of the Valley Division. 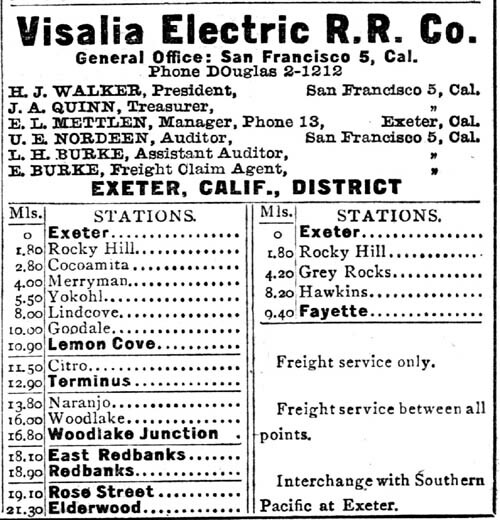 The Visalia Electric served the area east and north of Exeter with a southward branch toward Strathmore. Figure 4 is from a 1955 Official Guide. The coverage of the Eastside Lines is divided into the seven parts listed below. Parts 1 and 2 provide background information while Parts 3 through 7 cover the packing houses and other structures. The image locations are listed south to north geographically within each group. When new pages are added the date will be shown.